Also available as e-book at Amazon Kindle-Shop, Apple iBooks, Google Play. Recruiting pilots has developed into a process with a scientific methodology. Airlines base the selection of their pilots on both the aviation and social qualifications of the individual applicants, and ensure their decision using the tools of suitability diagnostics. Cognitive and operational performance tests are the start of most selection processes. These are used to test the basic psychomotor skills a pilot requires in their everyday work. The performance tests include an in-depth psychological screening of the applicant, the focus of which is an extensive interview. Airlines (and passengers) expect absolute reliability and professionalism from pilots. The interview is therefore in place to determine a pilot's motivation and to make predictions about his or her probable behaviour after being hired. Leadership skills in teams, communication skills and decision-making skills are just three of the characteristics that airlines value highly and which are examined at interview. In SkyTest® Airline Interview (ISBN: 9783744822510) we have presented the theoretical basis of the interviews for pilots and air traffic controllers. 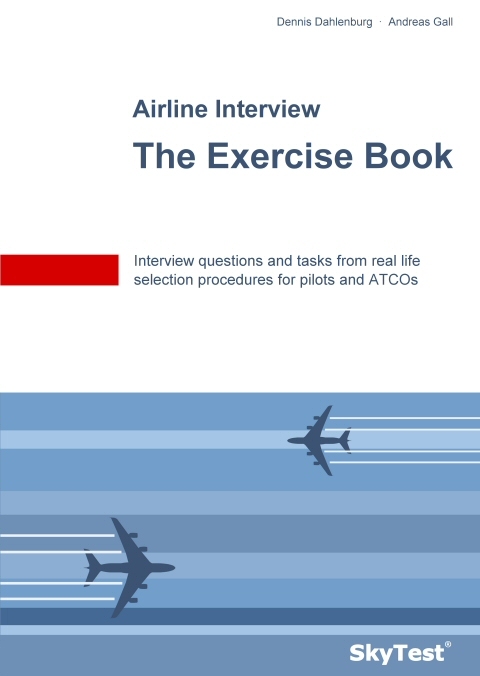 We have created SkyTest® Airline Interview - The Exercise Book for practice-oriented and tailored preparation for an interview with an airline or air traffic control centre. SkyTest® Airline Interview - The Exercise Book chronologically takes you through typical sections of a selection interview with an airline. The book gives you deeper insight into common interview questions. A variety of examples and exercises will help you to respond spontaneously and confidently in future interviews. Both authors of SkyTest® Airline Interview and SkyTest® Airline Interview - The Exercise Book added years of industry experience and expertise to the books. The German version of this book is available on our German website www.skytest.de.